Recently, one of our users reported that they are missing the admin bar on their WordPress site, and asked for our help. The admin bar is a floating bar that appears on every page of your site when you are logged in. It contains some useful shortcuts to different sections of the WordPress admin area. In this article, we will show you how to fix the missing admin bar issue in WordPress. Why Missing Admin Bar Issue Occur? Usually this happens when a plugin or an active theme is not allowing WordPress to properly execute the code in the footer area of your website. This code is triggered with the function <?php wp_footer(); ?>. When a theme is missing this code, or a plugin does something that messes it up, then you will end up with a missing WordPress admin bar issue. The most common culprit causing this problem is a missing <?php wp_footer(); ?> line in your theme. This function is usually found in a theme’s footer.php file just before the </body> tag. Before you do anything to fix it, make sure you create complete WordPress backup or at least backup your theme files. Connect to your website using an FTP program like Filezilla, or use the File Manager in your web hosting account’s cPanel dashboard. Next, go to your theme folder which is located inside /wp-content/theme/ folder and download a copy of your theme’s folder to your Desktop as backup. You would need to locate the footer.php file inside your theme folder and scroll down to the end of the file to see if you have <?php wp_footer(); ?> line before the </body> tag. If you do not have this line, then you need to add it and then upload the changed file back to your server. If you are using a child theme and your child theme does not have a footer.php file, then you need to check the parent theme’s footer.php file to locate the wp_footer function. If adding the wp_footer() function to your theme does not solve the missing admin bar issue for you, then don’t worry there are other things you can do to troubleshoot this error. Temporarily switch back to a default theme. Sometimes you may see wp_footer function in your theme files, but the admin bar still might not work. In this case, you need to switch to a default theme to make sure that your current theme is not causing this issue. A poorly coded plugin can cause this error as well, so to check if a plugin has caused this issue, you need to deactivate all plugins on your WordPress site. If this resolves your problem, then this means that there was a plugin that caused this issue. Now you need to figure out which plugin caused this issue. You can do this by reactivating your plugins one by one until you find the plugin that caused the issue. Lastly, you can turn the debugging on by opening wp-config.php file and changing define('WP_DEBUG', false); to define('WP_DEBUG', true);. WordPress will now show you warnings and notices that were previously hidden. These warnings and notices can hint towards the file causing this issue. 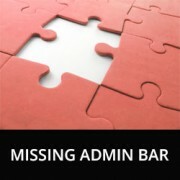 That’s all, we hope this article helped you fix missing admin bar issue in WordPress. You may also want to check out our guide What everybody ought to know about the WordPress admin bar. I recently over the last two weeks had my WordPress Admin Bar go missing on all but about a half dozen pages of my 560 WordPress Elegant Thems DIVI and DIVI Builder site. I tried all the fixes posted here and discovered that my change of the web page URL in setting to take advantage of my ISP provided security certificate, making the address a https versus http caused this issue. I changed it back to a http URL and it resolved it allowing the WordPress Admin Bar to come back on all 560 pages. My ISP is using PHP 5.4 and I have the most current WordPress 5.1. thought I would share. This has been a big challenge to resolve. Hoping my ISP can advise why this could be. You may want to also check with your hosting provider to ensure the SSL certificate was added correctly. You may want to disable CDN and W3 Total while doing edits. That allows me to see the edit bar and also see changes I make real time. The best solution that worked for me is creating a new user and if the issue repeats, then clear cache. I have tried all of these. Nothing. Admin bar still not showing. I login and I go straight back to logged out. Can only get to dashboard through direct link. Any suggestions? Bluehost “service” is non-existent. Check the ‘Admin Bar Menu’ setting in Yoast SEO>General>Features. It must be set to “OFF”. @IONUT – thanks for saving my day by leaving this hint here. Adminbar was not showing up only on Edge, adding those rules in WPFC solved it. Never would have thought of this! I have added the part as described and it shows up when I look at the files, however it does not show up in the actual liive website. Looking at the source code there, I can just see inserted code from the plugins. I also checked with my provider one.com as well and they cant replicate the issue, it works for them using my account. So i reformatted my pc to make sure its not a browser issue, still the problem is happening. Also tried the default theme and diasbling all plugins as well as adding code to the htaccess file..
Just add another user account it was the easiest way to solve the problem. Suddenly i have found that my admin bar (logged in user) info open to all viewers. Its horrible. Need a solutions. When I try to login via the front-end of the site, I enter my credentials, and hit log in. The page refreshes, and I’m not logged in. The admin bar does not appear, and I cannot access member-only parts of the site. When I log in via wp-admin, I can log in just fine. I go to the back-end admin dashboard. However, when I, while logged into wp-admin, browse to the main site (kmtc.be) it still shows I’m not logged in. The admin bar does not appear, I cannot access member-only parts of the site – despite being logged in. I’m thinking there’s some sort of breach between the back and front end of the site. When I deactivate all plugins, the problem persists. When I change the theme AND deactivate the plugins, still, I can’t login. I’ve done an overwrite of all wordpress and theme files – I still cannot login via the front-end. If nothing mentioned in the post works, try changing the WordPress Address (URL) and the Site Address (URL) at Settings > General by adding or removing the www to them. If it works, you can switch it back then. thanks man! this solved my isue. It seems that some url rewrite in the database was not completed and after doing what you instructed it gets updated and all gets back. simple as that. This did it for me. Nothing else in this thread helped, but this did it. Thank you for this. Duly noted this fix! 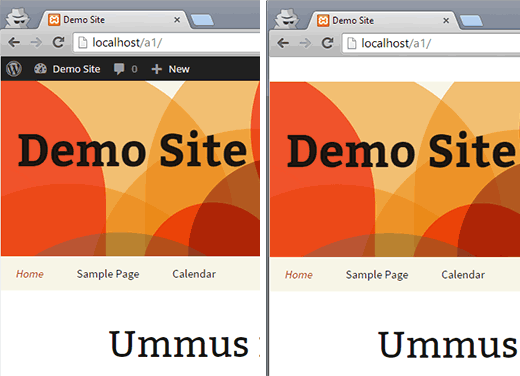 In my case it was a CSS conflict hiding the text of the wpadmin bar. But not CSS from the theme or plugin stylesheets. It was a Chrome extension called Stylebot adding conflicting CSS that hid some of the items. I noticed there was some script code below the wp_footer() call. I moved that line of code to below the script and my admin bar came back. none of these solutions worked for me! something weird happened to my site when I log in I cant view admin bar and also visual composer grid posts dont load they show nothing I have to admit that in my previous server i didnt have this problem can the problem be caused becauase of something related to server I recently moved to? Thanks for posting this! However, after trying these suggestions, discovered that my problem was Sucuri security plugin hardening settings, which did not go away even when the plugin was turned off, so it masked the plugin being the problem when I tried that troubleshooting step that you listed. I had to reactivate the plugin and “unharden” the settings to fix the problem. (Not sure which specific hardened item did the trick, as I just reverted all to the original state.) It also fixed the problem we were having with the visual editor not working as well, by the way. Overzealous security setting! Just sharing this in case someone else is pulling out their hair like I was and wishing a search had brought up this particular issue that was not easily uncovered. What do we do if the line IS there? I checked my file and everything is AOK. The wierd thing about my development site I am playing with is that if I go to the HOME page, the admin bar goes away. If I navigate to any of the other pages, the admin bar comes back. What is causing this? I just changed to the parent theme again and it worked. Worth to try changing themes. in my case it was because of a caching plugin (fastest cache). I m not 100% sure why but it was about caching issues. Thank you for the blog… This saved a lot of headache for me and helped me to solve my missing admin bar problem. HELP! I can’t figure out what in the world is wrong with this theme… I’m mostly just changing the CSS, as it’s a theme that I’ve built and used on other WordPress sites before without problems. The and are in the right places. I checked to see if this problem existed with the other pre-installed themes and it is! So I thought maybe plugins… I deactivated, then deleted all my plugins. Nothing. I’m out of luck and don’t have a clue what to do now. Any ideas? Thanks! Genius. Just making sure the box was checked worked for me! It was strange because it has been working perfectly and it suddenly stopped, but really happy you showed me where to look first! worked like a charm…you are the best! Had the same problem, tried a lot of suggestions, but them I found out there war a white line in the header. Removing the white line did the job. Hello, thanks a lot for making this post, but unfortunately in my own case the admin bar shows for only users with admin roles. Users with roles such as shop manager do not see the admin bar at the front end, but they see the admin bar at the back end. Is there a possible solution for this fix? Also helpful would be to mention that you can deactivate your plugins by renaming the folders in your plugins folder, via FTP. (I usually put an underscore at the beginning of the name, such as ‘_akismet’). The ‘disappearing admin bar’ happened to me recently and I was unable to log into the dashboard with the ‘wp-admin’ suffix in the url. I deactivated the site’s plugins via FTP and was able to get back in the dashboard to do the rest.